Applications for free training with accommodation are Invited from students belonging to Minority Communities who are Interested to Join Indian Army and Allied Forces. Each and every candidate from training institute will be insured for 45 days i.e., during the training period, no stipend will be provided to the candidates during training period & training will be given only once to each student. ** Students belonging to Minority Community (Muslim, Christian, Jain, Sikh, Buddhist and parsi) who are interested in joining Indian Land Army, Naval Army, Air Force and other Defence Forces are eligible to apply. 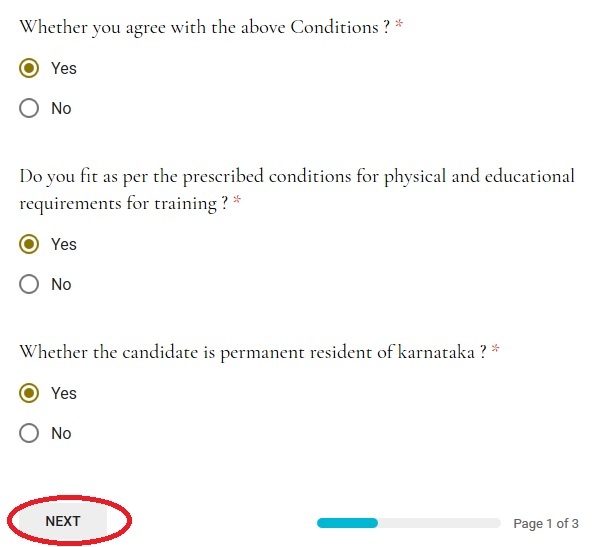 Step 1 : Go to the official website of Directorate of Minorities Karnataka provided above. Step 4 : Next fill the remaining details to complete the online registration. ** Training will be given only once. ** Attendance will be taken through bio metric mode, 80 percent of attendance during the training period is mandatory. ** Candidates will be having an option to select the training institute as per their convenience and interest. ** After completion of Training program, certificates will be provided to the candidates from the concerned institute. ** No stipend will be provided to the candidates during training period. ** Each and every candidate from training institute will be insured for 45 days i.e,during the training the period. ** Amount will be reimbursed from trainee candidate if they discontinue the training program in between the prescribed tenure of training. ** If any of the information or documents/income & caste certificate submitted by the students are found to be false at any stage then the strict action shall be taken against the applicant and the amount spent on the trainee shall be collected from him. Last Date for filling out & submitting online application form along with the required document is 15-12-2018.